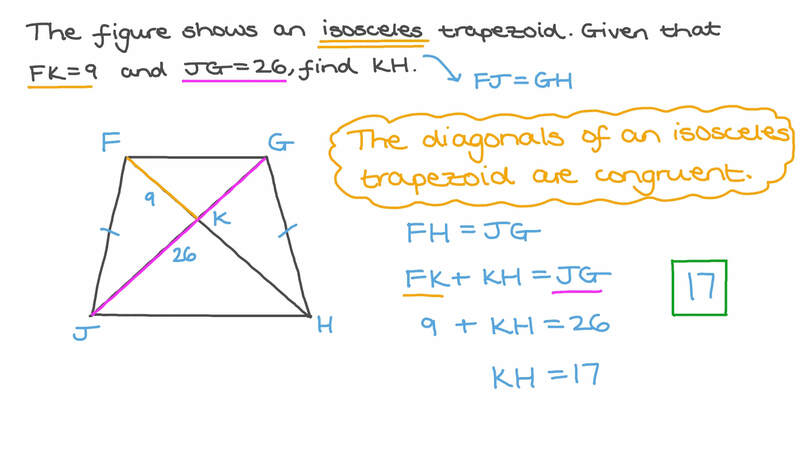 In this lesson, we will learn how to identify an isosceles trapezoid and use its properties to solve word problems. Choose the option that makes this sentence true: A trapezoid have exactly one pair of congruent sides. How many trapeziums can you count? The figure shows an isosceles trapezoid. Given that 𝐹 𝐾 = 9 and 𝐽 𝐺 = 2 6 , find 𝐾 𝐻 . Which statement is true for the given trapezoid? A The trapezoid has two acute angles. B The trapezoid has two pairs of perpendicular sides. C The trapezoid has two right angles. D The trapezoid has three obtuse angles. E The trapezoid has two pairs of parallel sides. The speaker shown is an isosceles trapezoid. If 𝑚 ∠ 𝐹 𝐽 𝐻 = 8 2 ∘ , find 𝑚 ∠ 𝐹 𝐺 𝐻 . Given that 𝐽 𝐾 𝐿 𝑀 is a trapezoid and 𝑚 ∠ 𝑀 = 6 8 ∘ , find 𝑚 ∠ 𝐾 . Given that 𝐴 𝐵 𝐶 𝐷 is a trapezoid and 𝑚 ∠ 𝐵 𝐶 𝐷 = 1 0 1 ∘ , find 𝑚 ∠ 𝐷 . A frame is to be constructed in the shape of a regular trapezoid with a perimeter of 50 inches and a height of 8 inches, where both of the nonparallel sides have a length of 10 inches. Work out the lengths of the two parallel sides. Given that Engy is cutting a piece of fabric, where the top of the piece measures 2 ft, the bottom measures 3 ft, and each side measures 4 ft, determine the shape she is cutting the fabric. 𝐴 𝐵 𝐶 𝐷 is an isosceles trapezium where 𝐴 𝐵 = 𝐴 𝐷 = 𝐷 𝐶 = 8 c m and 𝐵 𝐶 = 1 6 c m . Find the area giving the answer to two decimal places. Find the area of an isosceles trapezium 𝐴 𝐵 𝐶 𝐷 , given 𝐴 𝐵 = 𝐴 𝐷 = 𝐷 𝐶 = 3 c m and 𝐵 𝐶 = 5 c m . Give the answer to one decimal place. An isosceles trapezium of area 74 is divided into two symmetrical pieces by its line of symmetry. What is the area of each piece? If 𝐸 𝐵 𝑀 𝐿 is an isosceles trapezium, then which of the following is true? The figure shows an isosceles trapezoid. Given that 𝐹 𝐾 = 9 and 𝐽 𝐺 = 2 1 , find 𝐾 𝐻 . The figure shows an isosceles trapezoid. Given that 𝐹 𝐾 = 8 and 𝐽 𝐺 = 2 7 , find 𝐾 𝐻 . Given that 𝐴 𝐵 𝐶 𝐷 is a trapezoid and 𝑚 ∠ 𝐵 𝐶 𝐷 = 1 1 7 ∘ , find 𝑚 ∠ 𝐷 . Given that 𝐽 𝐾 𝐿 𝑀 is a trapezoid and 𝑚 ∠ 𝑀 = 7 5 ∘ , find 𝑚 ∠ 𝐾 . The speaker shown is an isosceles trapezoid. If 𝑚 ∠ 𝐹 𝐽 𝐻 = 7 5 ∘ , find 𝑚 ∠ 𝐹 𝐺 𝐻 . The speaker shown is an isosceles trapezoid. If 𝑚 ∠ 𝐹 𝐽 𝐻 = 6 8 ∘ , find 𝑚 ∠ 𝐹 𝐺 𝐻 .